They may be small, but bugs and moths can do big harm to your favorite fall and winter fashions during the off-season. If you did your homework last spring, you stored your cashmere garments properly by cleaning them before tucking them away; ensuring the storage area is dry; and wrapping your storage boxes in nylon netting to make sure nasty critters like silverfish and moths can’t enter. Consult your local tailor or dry-cleaner to fix your favorite pieces. Don’t leave damaged clothing in your closet. You won’t wear it, and neglected items could easily become a breeding ground for insects. Keep the yarns that come with your knits in one safe spot for the future. Of course, an ounce of prevention is worth a pound of cure. 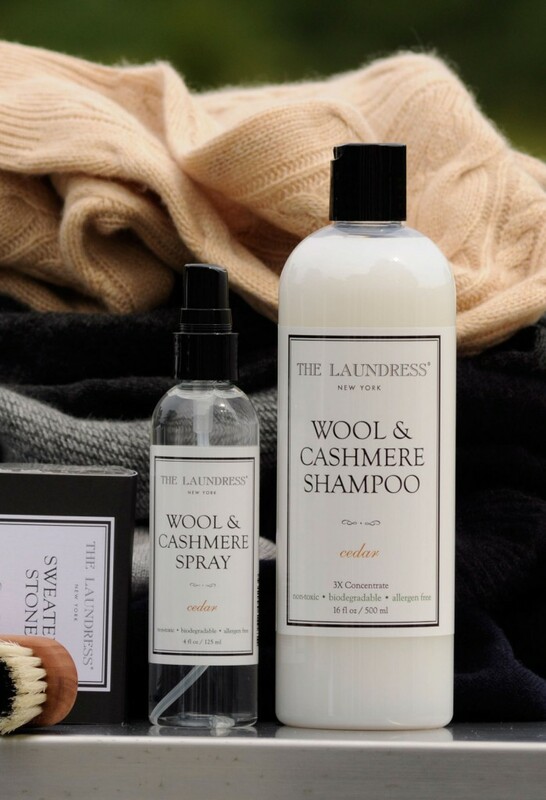 Therefore, make sure The Laundress Wool & Cashmere Shampoo and The Laundress Wool & Cashmere Spray are staples in your laundry room to prevent future incidents. We sing the praises of The Laundress daily. Really. And please don’t store your pretty things in plastic or cardboard. Instead, pack clothes in a breathable cotton or linen fabric pouch with a zipper. Avoid humid and damp areas like the attic or basement, which are optimal environments for moth breeding. Silverfish, too, thrive in damp locations — and they love to nestle into your warm, bulky textiles as much as you do. We also love The Laundress fabric-care products because they naturally repel icky bugs in a safe manner — without noxious odors. Please stop by the shop today to learn more about The Laundress collection and how you can keep unwelcome creatures away from your closet.